Throwing caution to the wind, Tim Dunne splashed out on an 2003 Mercedes-Benz SL55 AMG R230 after years spent driving down-to-earth diesels… Words Dan Furr. Photography Dan Sherwood. The four-door’s attractive asking price was due to a suspected gearbox complaint. Tim took the car to a trusted mechanic who immediately recognised the problem to be linked to an electrical fault. A quick fix marked the beginning of five fault-free years of happy motoring until the trusty C-Class made way for an Audi A6. More than happy to add his name to the supercharged V8’s logbook, Tim was soon driving a minty fresh Mercedes sharing very little in common with the conservatively dressed diesels he’d been commuting in. How did he find jumping from a sensible saloon into a near-500bhp AMG billed as the most powerful production Mercedes ever built when the model was launched in 2002? “The way the supercharger delivers power from the 5.4-litre V8 is intoxicating!” he roars. “The car is nothing short of amazing, offering masses of grip and totally obedient handling. I’ve managed to lose the back end a couple of times, but only on loose surfaces, and only when I’ve really punished the car in the hope of achieving a bit of spin.” He’s also thrilled to be charge of a convertible which manages to achieve the rare feat of looking just as good with the roof up as when it’s folded down. He admits to dropping the retractable hardtop – a process taking just twenty seconds – whenever he’s out and about exploring the massive 516lb/ft torque his silver plaything promises to exploit. “I see little point in owning a convertible and leaving the roof up,” he reasons. “That said, I do allow the car to maintain its coupe-esque looks if my wife, Claire, is with me. She doesn’t like the bluster of open-top motoring messing with her hair!” he roars. Enhanced by Turbine wheels, the beautifully proportioned lines and sleek curves of the SL55 AMG we’re looking at make it difficult to believe we’re in the presence of a Sportlich Leicht approaching its twentieth birthday. Indeed, if Tim stuck a personalised number plate at each end of his road rocket, most admirers less than familiar with the Mercedes product range would be forgiven for thinking he was pulling up in a car far newer than a fifth-gen SL. “People want to speak to me about my SL55 whenever I stop at a fuel station or parking lot,” he smiles. “All credit to Mercedes for developing such an enduring styling package. It’s a real talking point when I'm on my travels.” Proving the model’s appeal, another of his Mercedes-owning mates rushed out and bought an SL55 AMG immediately after being bowled over by the look, sound and performance of the supercharged speed machine being enjoyed by the Dunnes. We can see why! Clearly, the force-fed AMG’s form is a huge part of the appeal, as is the function of the M113 V8 nestled beneath that long bonnet, but it would be churlish of us not to acknowledge the fact these cars have a reputation for going horribly and expensively wrong. Perhaps unsurprisingly, common faults are usually associated with stock R230 componentry, including temperamental electrical systems and the convoluted roof mechanism. No such problems for Tim. “I’ve covered eleven thousand miles in the car without complaint,” he assures us. His chosen spanner man is Albert Lock, a well-known Mercedes specialist based in Rushden. Lock has been responsible for all the car’s servicing and health checks throughout Tim’s happy five years of AMG ownership. The seasoned Mercedes mechanic has repeatedly confirmed his opinion the shimmering two-door is an exceptional example of an SL55. More importantly, he's happy to report it's an AMG completely free of fault. 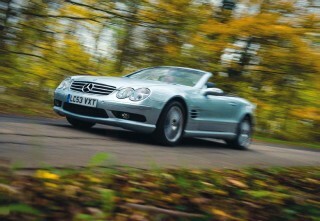 Coupling devastatingly good design with a massive amount of power, the SL55 AMG is a modern classic. Bag a good one, and you’ll wonder why it took you so long to buy one of the fastest and best-looking production sports cars assembled since the turn of the millennium. Speak to Tim if you need further convincing regarding the value for money offered by this marvellous Mercedes. He’s very good at spending carefully, or so we were led to believe! Above Supercharger allows for instant access to the car's massive torque, a feature Tim enjoys taking advantage of. 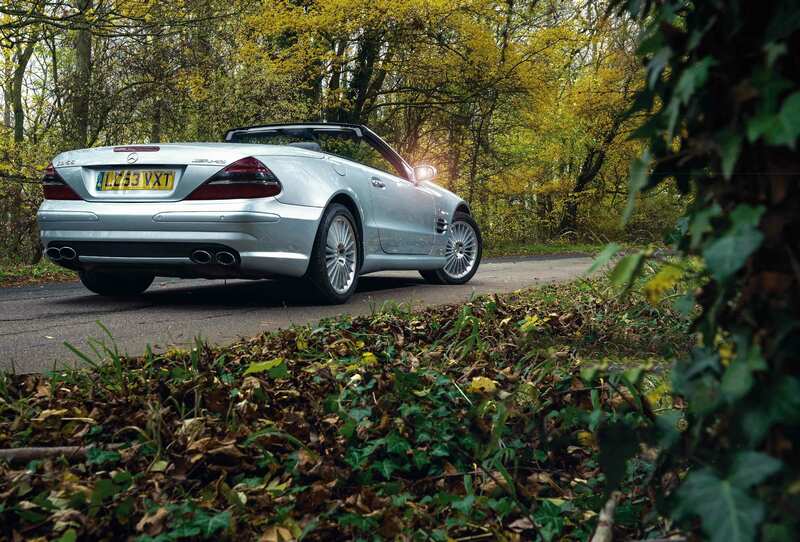 Best thing about your SL55 AMG The linear delivery of supercharged power. Worst thing about your SL55 AMG It’s far too good to use as my daily. Below Tim's pre-facelift SL55 AMG achieves a full roof retraction in twenty seconds, whereas the later R230 SL55 AMG managed the same task in no more than sixteen seconds.